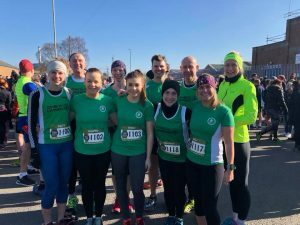 Another weekend of PBs, 1st time at half marathon distance for Run for Fun graduates and category wins at Denbigh Harriers with 36 Harriers competing in 6 events. 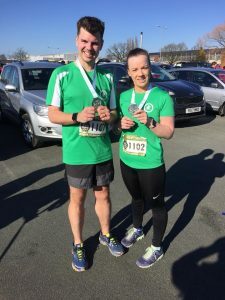 Shaun Hughes training hard for his London Marathon Elite place led the field at Wrexham Village Bakery Half Marathon, coming 30th in a race he placed 85th in last year. Shaun also took another 1 minutes 33 seconds off his personal best, bringing his time for a half marathon down to 76:26. Not to be outdone was Craig Jones completing the course in 1:27:28 at his first time over the distance. 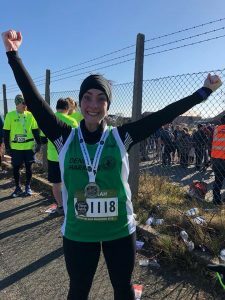 Other notable performances include Hywel Roberts 1:44:18 and Hannah McDonnell 2:10:11 with Run for Fun graduates Sali Powell 1:56:42 and Rhian Wyn Jones 2:10:22 all in their first half marathon’s and Melina Morris 1:47:06 with Katy Baugh 1:49:32, Hawys Roberts 2:05:43 and Ffion Jones 2:09:08 all completing their first half’s as they continue their training for the London Marathon. David Jones 1:48:41, Ian Jones 2:10:22 and Lisa Dafydd 2:17:28 completed the Harriers on the course. 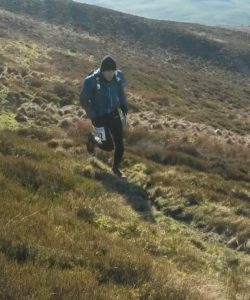 This weekend saw the Clwydian Range inaugural 17 mile Sheep tracks fell race with 16 checkpoints to navigate with a route of the competitors choice. Like elsewhere the skies were blue but wind cutting with terrain frozen underfoot. First home for the club was Tony Wood 8th (Open); Vic Belshaw (M50) 21st; Glen Price 31st (M40); Emma Collins 38th (F50); Ceri Belshaw 40th (Open); Owen Conry 45th (M40) and David Say 65th (M60). All the proceeds from the race go to our local Mountain Rescue Team who staged a very professionally run event. A little closer to home were the Ruthin 5k and 10k races. The very cold conditions made fast times much harder to achieve so PBs and category wins here were worth a lot. Winners included 10k: 15th & 1st Male 60 Martin Cortvriend 42:39. 5k: 15th & 1st Male 60 Chris Baldwin 24:21, 28th & 3rd Female 40 Abigail Corfe 26:36, 3rd Male 60 Jeff Jones 31:25, 3rd Female 60 Vicky Cortvriend 33:38. PBs were also achieved in the 10k for Phil Hayes 12th 42:14, Huw Williams 16th 43:18 and Nicola Field 1:01:48. Angharad Gilbert finished in the 10k in 1:04:41, Dawn Marshall 1:10:38. 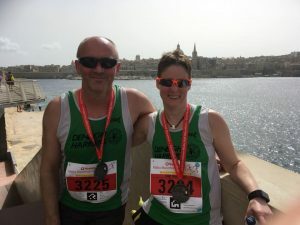 Much further afield were Caroline and Rob Parry competing in the sunnier 18℃ Malta half marathon. Caroline showed great form as she trains for her first half ironman this summer completing the course in 2:19:23 with Rob just behind in 2:22:44. The weekend was rounded off with Parkrun with 3 runners completing the Conwy course in icy conditions. 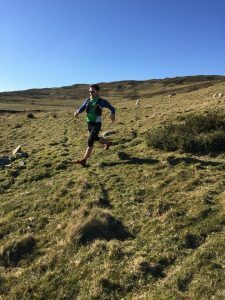 Phil Hayes was 12th 20:45 in his first run of the weekend, followed closely by Tony Benton (27th) 22:20 and Sarah Bayliss returning strongly from injury as 18th Lady in 27:13. Elen Baugh completed the Woodhouse course in 23:59 whilst Sian Pritchard ran Bushy in 28:27. Tony Wood 8th (Open); Vic Belshaw (M50) 21st; Glen Price 31st (M40); Emma Collins 38th (F50); Ceri Belshaw 40th (Open); Owen Conry 45th (M40) David Say 65th (M60). 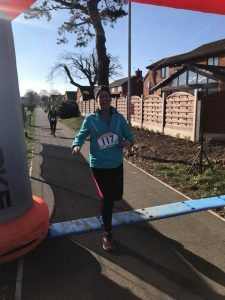 This entry was posted in 10k, 5K, Fell running, Half Marathon, Parkrun, Road running, Run for Fun. Bookmark the permalink.